Product prices and availability are accurate as of 2019-04-22 20:38:27 UTC and are subject to change. Any price and availability information displayed on http://www.amazon.com/ at the time of purchase will apply to the purchase of this product. 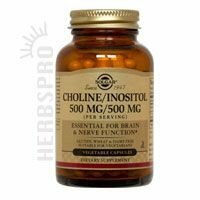 Three bottles of Choline/Inositol to be used as a dietary supplement. Serving Size - 1 veggie cap Does Not Contain: Sugar, salt, starch, corn, yeast, wheat, soy, dairy products, preservatives, artificial flavors or colors.